I am embroiled in preparing for 2 online courses at the moment. One is the Intrac Online M&E course – we have 17 participants spanning 4 continents. We’re using Moodle as the asynchronous course platform, for discussions, homework and resources, and Blackboard Collaborate as the synchronous workshop/seminar platform. I’m also starting to train today on an in-house Virtual Facilitation Online course with the Center for Disease control in the US, alongside with my ICA:USA colleagues Ester Mae Cox, Nileen Verbeten, Brenda Schmidt and Sheila Cooke. For this, we’re using Wiggio for the asynchronous component, and Adobe Connect for the workshops. This is giving me a great opportunity to compare and contrast different platforms. Part of course design, in addition to creating content, is designing for learning and fostering peer interaction: this is often sacrificed in online training, but in fact, it becomes even more important to design, as it doesn’t necessarily happen naturally when people aren’t milling around drinking coffee together and chatting when they sit beside each other. Within our training, we’re pushing ourselves to continuously model best practice in online facilitation…. to avoid webinar-induced comas! The revolution in remote working and virtual meetings has taken hold, but our skills haven’t necessarily kept up. 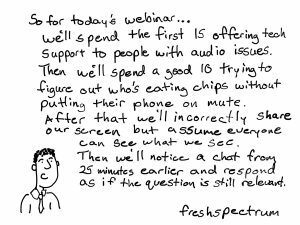 Learn to run excellent virtual meetings and workshops. ICA USA and ICA UK have been in existence for over 50 years, teaching people how to maximise engagement and participation in the voluntary and NGO sector. Now our skills have been applied to remote facilitation. Gain competency leading virtual meetings with Adobe Connect, and ToP Focused Conversation. Build your confidence as a virtual facilitator. Learn tools and techniques for eliciting participation, virtual meeting design, and best practices for smooth and engaging facilitation. No special skills or equipment needed apart from a computer with an internet connection, and a headset. OCR, on behalf of the UK Embassy of the Kingdom of the Netherlands, is convening a series of working groups on sport and cohesion. More information is available here. If you are attending either the UK or the NL workshops, and have not yet completed the prework, please contact me for the links to the survey and ‘dropbox’. Delighted to be convening this session at the Laureus Global Summit in London next week. Very much looking forward to seeing some familiar faces, as well as meeting lots of new colleagues. The handout with additional resources is here, and the presentation (or should I call that a prezi?) is here. Orla is training with ICA:UK on the Group Facilitation Methods courses in Dublin (14th & 15th June) and Limerick (16th & 17th June). There are still some heavily discounted places available on both of these courses. Contact www.ica-uk.org.uk or call 0845 450 0305 to learn more and to reserve your place.